This fall, participants of Stepping Stones’ Adult Day Services program rallied support across the Norwood community and hosted a Fall Food Drive! Following the theme ‘One Can Can Make a Difference,’ they collected countless non-perishable food and personal care items for St. George Food Pantry in Clifton. The largely successful food drive was truly a team effort, with participants researching local food banks most in need, developing flyers for the campaign and performing outreach to rally community support. RCL Benziger and Whole Foods of Rookwood also kindly donated bags that participants distributed throughout the neighborhood for collecting food drive items. Hitting the pavement, adults asked neighboring households to join in! They also rode the Metro bus to Surrey Square in Norwood – recruiting Kroger’s, Marshall’s and Pizza Hut’s support in collecting donations for the food drive. It was a large community effort, with participants, families and businesses coming together in the spirit of giving back and helping those in need. 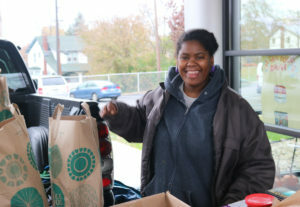 On November 15, participants loaded boxes upon boxes and bags upon bags of donations into a truck for delivery. On a community outing, a group personally delivered the large donation of food and personal care items to St. George Food Pantry. It was a rainy and chilly afternoon, but no amount of rain could spoil the joy on everyone’s faces as they contributed soups, pastas, cereals, toothbrushes and more. No doubt, the large amount of donations will help those in need during the weeks ahead. “We named the campaign ‘One Can Can Make a Difference’ because that’s all it takes,” said Sherri G., an organizing participant of the food drive. “If you’ve ever been in a place of need, then you know the value of one can of food. Thank you to all of the families and local businesses who supported our participants and helped make the fall food drive such an overwhelming success!